We pride ourselves on the quality, frequency and advanced level of training we provide. Improve your productivity and knowledge with SOLIDWORKS training and SOLIDWORKS partner product training. Alignex offers certified instructor led training in facilities throughout the upper Midwest including MN, IA, CO, NE, ND, SD, WY and WI. We offer training online, on-site, as well as customized to meet your needs. Our trainers at Alignex are certified by SOLIDWORKS in the areas they teach. We guarantee you will be trained by an expert in the software you are learning. All of our instructors are very well spoken and communicate the course materials in a clear and thorough manner. The trainers are the same Application Engineers that work our support desk, so they can help students with specific issues related to the products they will be working with regularly. How can we exceed your training needs? Plan for your training requirements by viewing the classroom courses available for SOLIDWORKS products, including SOLIDWORKS, SOLIDWORKS Simulation, SOLIDWORKS Product Data Management, SOLIDWORKS Composer and more. Some users require more specialized training outside our posted courses. We offer custom training for software platforms, design process techniques, project management, certification exam preparation, and much more. We also arrange for Custom SOLIDWORKS Training at customer facilities to save them travel expenses and to provide a condensed curriculum. For those new to SOLIDWORKS who are committed to getting up to speed quickly, Alignex offers an Exclusive Discounted Training Program called the Alignex Passport Training. For a one-time fee, the 7 most popular SOLIDWORKS Training classes are available for an individual student to take once each over a 12 month period. Our Virtual Training is instructor led training for SOLIDWORKS delivered LIVE over the Web and is available for select course offerings. Our virtual classes follow the exact same curriculum as our classroom training but with the convenience of remaining in your home or office! Over 20+ certified instructors with unequalled industry experience. 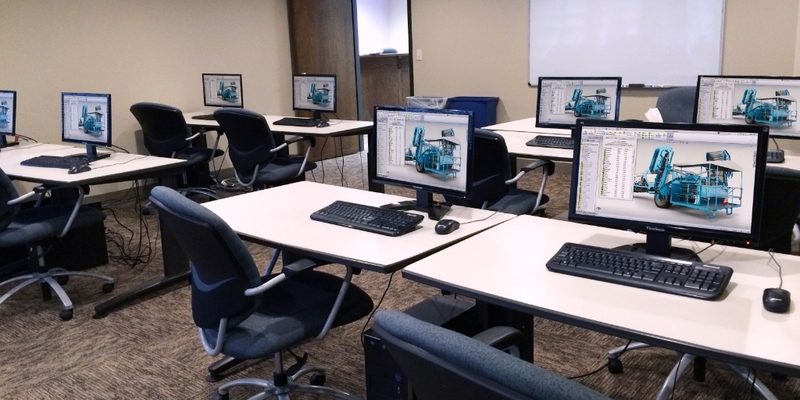 Interactive hardware and software setups create a collaborative training experience. Morning snacks, coffee and catered lunches for classes at our offices. Classes are available at our eleven regional facilities in seven states. We can bring a great training experience right to our customers.